This blog is a personal space for me to record my daily adventures as a stay at home mother of two. Where oh where do I start?! It seems it hits me the same time each year - the need or rather DESIRE to 'upgrade' our home appliances - there must be something in the clean, crisp autumn air that inspires me :). While there is nothing physically wrong with our current appliances, one can dream can't she!? I like to think I'm just getting 'prepared' for when the time comes. With that said, I happened across a VERY helpful site - that provides reviews of household goods among other things. Today, my appliance of choice, was The Washing Machine. The folks at Wize.com have taken all the footwork - or 'clickwork' I should say of roaming the internet for reliable reviews. The variety of appliances were unreal - over seven full pages of individual reviews and detail to review. To add to my surprise, were the number of reviews Wize.com provided - honest to goodness reviews from folks like me :). If you can believe it, one appliance held over ONE HUNDRED REVIEWS!!! Their site provides excellent detail of the items and allow you to sort by Relevance, Price and 'WizeRank'. They preview all the top brands ... and then some .. and the best part, their site so so incredibly easy to use, even a busy Mommy like me can get in and out without any problems, and pick up where I left off if I'm called away from the computer. They even sort by Best Value, Energy Star Rated and Noise - honestly, the top three requirements on my list! I LOVE Wize.com, because I'm not forced to try to remember what site I was on when I read about this, or what was said on that. It's a one stop preview to my shop. When I'm going to drop a load of money, I need to do my homework. Wize.com provides everything I need to take the first step. Thanks guys! GREAT Contests at Five Minutes for Moms ... AGAIN!! To help you beat your summertime rerun blues, 5 Minutes for Moms has arranged to give away 5 FREE 6-month subscriptions to Netflix. The Biggest Bang offers never-before-released duets with artists like Dave Matthews, Bonnie Raitt and Eddie Vedder and other rare, never-released tracks including “Get Up, Stand Up” and “Mr. Pitiful,” from a 2005 performance in Toronto. With more than 55 songs and footage from around the world, including concerts in Argentina, Japan and China, and full length concerts from the Rolling Stones historic show on Rio de Janeiro’s famed Copacabana Beach which was attended by two million concert goers, and a concert in Austin, Texas, your Dad will have a complete Rolling Stones experience. Check them out - and cross your fingers! Oh my goodness.... what date is it!? Oh my goodness gracious, has it been a week since I posted?! lol :). Alot of my free time has been taken up planning and preparing for the arrival of my parents. My parents will be visiting from Minnesota for a few weeks - and WE ARE SO EXCITED - did you hear that!? EXCITED!!! Heather @ Cool Zebras - Tackle it Tuesday: "Amy Knapp's Family Organizing Handbook: 314 Mom-Tested Super Tips, Tricks and Secrets to Take Care of Everything with Time Left for What Really Matters"
Don't forget to leave a comment and/or sign Mr. Linky below to be entered into a drawing -- see the post 'Gotta Have a Little Fun' below for details!!!! Oh yes, another chance to win!! Visit a great new blog I came upon via Jenny Jumps In. Pinks and Blues has tons of great ideas and info - and an incredible drawing going on. Be sure to check them out - and get on over there for a great chance to win a Dooney & Bourke Bag and beautiful Victoria's Secret Perfume - YEAH!!!! REMEMBER - To mark my FIRST WEEK at my table for one :) - I thought it would be fun to have a little contest. Tackle it Tuesday: "Amy Knapp's Family Organizing Handbook: 314 Mom-Tested Super Tips, Tricks and Secrets to Take Care of Everything with Time Left for What Really Matters"
I saw this book at 5 Minutes for Moms - it looks like a great resource. Tack it Tuesdays is sponsored by 5 Minutes for Moms (see link and button to the right :)). Chance to enter will end May 30th at Midnight - winners will be drawn bright and early via Mr. Linky bright and early May 31st. There are no sponsors to this little fun - other than my hubby who brings in the moola each week :) - but I thought it would be fun (as well as a shameless plug) to offer an incentive to visit - and hopefully, make some new blogging friends. I've bookmarked and linked to so many other mommy blogs - I've learned a lot and laughed a lot. Visiting is a great break in my day - hopefully you will feel the same with Table for One :). Things are a little unorganized right now - but I hope to have things up and organized within the month so please be sure to drop a note and stop back from time to time!!! Who knows what you might find!! Friday - Out to eat! A New 'Fav' to Add to My List! I stopped by Ann Wood this morning to check out her 'Daily Bird' :) - to find that she will be out a bit. In addition, she left a link to check out. Boy am I glad she did!! She linked to Laura Normadin's new blog. She has beautiful handcrafted goods including crocheted bracelets, hairpins, unique cards and tags, incredible handmade dolls made to order and the cutest elephants that brought back memories of a fun patchwork doggie I had when I was little. Laura's items are whimsical and have a fun twist on a traditional craft. She's made it into my bookmarks and list of 'favs'. Take a moment to stop by and see for yourself. I dare you to leave without something in the shopping cart! a slice of watermelon on a hot day? How about a Watermelon Mocktail? Place 1 cup watermelon puree, 1 teaspoon grenadine syrup, the juice of 1 fresh orange, 1 tablespoon granulated sugar and 2 cups ice into a martini shaker. If you want to turn the mocktail into a cocktail, add a shot premium vodka. Shake for 20 seconds and strain the chilled liquid into a sugar-rimmed martini glass.YUMMY!!! When I was drawn to receive a box of Fruity Cheerios's at Five Minutes for Mom's I was excited to have won .. but a box of cereal? Why couldn't I have won the Ipod they gave away last week!? :) Then, get this, the Fed Ex truck pulled into our driveway the day after learning we had 'won' and delivered our full size box of cereal. I opened it, looked at it, smelled it, and thought ... hmmmm .... miniature fruit loops :) - but then I tasted them ... and they were yummy. I looked at the nutrition panel - and not so bad :) - and another plus, they didn't shred the inside of your mouth after eating a bowlful (ya know what I mean!?). *Fruity Cheerios: 10g sugar, 110 calories per 30g serving. Leading fruity cereal: 14g sugar, 110 calories per 30g serving. **Excellent source of whole grain is at least 16g per serving; at least 48g recommended daily. OK -I like them ... how about the girls? LOVE....LOVE.....LOVE. OK - it is a sugar cereal, and that is something that doesn't normally make it into our home (mean mommy, yeah, I know). But, I would seriously consider buying them. Yogurt covered Cheerios have been on our shelf for months. The girls love them too, as are the traditional 'Os' (in a cleverly packaged store brand box) - but it's nice to have a little treat that you know comes from a name Mommy's have depended for ions! OK - I am NOT getting paid for this .... but I am going to plug the Little Tykes Ultimate Beach Ball Sprinkler like there's no tomorrow. What a GREAT idea. 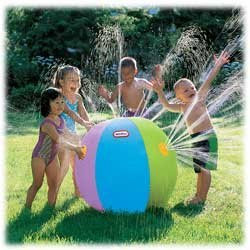 We picked on up at Target today - INSTANT FUN - in that all you have to do is blow it up and attach it to the hose. Moo and Loula Bell had fun playing for hours this afternoon. You can set the water pressure as high or low as you want, and they can push it and roll it around the yard - there are no sprinklers to step on or trip over. I LOVE it - can you tell? The spray is light - so no one gets a major swirly, and when you're finished, unhook it, and deflate or store. LOVELY!!!! We got ours at Target for $9.99 - Little Tykes has theirs listed at $14.99 Amazon has theirs listed for $18.99 - what's up with that?! I'm sure Walmart is competitive with Target if you haven't the big bulls eye in your area! :) Well worth the money spent in my opinion! Welcome everyone to Thyen Table for One. Many of you have gotten to know me on our family blog "Thyen Party of Four" and I'm glad you made the leap to check out my new site. What am I doing? I've created a new site for myself - not that I don't like blogging about the fam - as a matter of fact, I LOVE IT. BUT - after a year of blogging and visiting other sites and seeing what's out there, I thought it would be fun to have a little space of my own. A space to write, explore and have fun. A space to share my finds, favs and musings. I'll continue to write about the fam, but just won't be sharing the photos and other family news I usually do - those I'm reserving for friends and family - but you're welcome to bop back over there ANYTIME to catch up with what's going on with us!! This week, I've been working on creating my own personal blog. We will continue to maintain our family blog, but I've wanted to create one for me - a woman, mommy and wife, that doesn't necessarily include the detailed ins and outs to our days that we provide to keep out of state friends and families up-to-date (that was our family blogs original intent to begin with). And so, Thyen Table for One was created :). Oooohhhhh ... gotta try it. Combine 2 cups chilled green tea, 2 cups chilled white grape juice, 6 tablespoons freshly squeezed lime juice and sugar (to taste) in a medium-size pitcher. Pour over glasses filled with ice. In each glass, float small lime wedges or add a skewer threaded with lime slices or green grapes. Better yet, give Green Tea: 50 Hot Drinks, Cool Quenchers and Sweet and Savory Treats a peak - available at Amazon, Borders, B&N and other bookstores. You will find the above recipe among others (50 for that matter!). Looks like an investment well worth the money! There is a site I've been visiting over the year while blogging on our family blog. Laura at I'm an Organized Junkie is a talented Mommy who brings inspiration to us all and makes organization fun!! Check out her site and her weekly post Menu Plan Monday. Be sure to check out our menu below and all the other blogging Mommy's who contribute!! Monday: Tuna Noodle Hotdish (Casserole for those not from MN,WI,MI :) ). Friday: Out for dinner - DADDY'S HOME!! Get Paid to Write? Gotta give it a try! I've been blogging at our family blog for a little over a year. Originally, our blog was intended as a portal to keep up with friends and family after moving out-of-state. The blogging universe is an incredible thing!! Not only have reaped the benefits of the blogging community, I've also learned that I really like to write. And that, is what this post is about. After linking to a blog of a mom I haven't yet met via a link from another (and another and another you get the idea), I found out about a great opportunity online that would actually pay for the services of my blogging! :) Hmmmmmm. So I checked it out, and headed over to Blogsvertise to see what it was all about. Here's how it works. After you are approved, they will send you a site to visit. You have the opportunity to check it out later you write about it. You can write about it any way you like - a review of the site - incorporate it into a story - positive or negative - it's up to you. The only thing they really require is to write at least 50-60 words and link to the site three times in your post. After you've had a chance to write about it, you submit your work for approval and if it is approved and still posted in 30 days Blogvertise pays you $10 to your Paypal account. I can give that a try!!! I've registered and I'm waiting. Who thought I could get paid for my two favorite past times - writing and blogging! One of my goals for this year is to read more. Something I LOVE - but unfortunately with two little girls, I have gotten horribly out of shape in doing. I started in January - reading one book a week. I started with your traditional 'chick lit' (ie similar to the likes of Bridget Jones' Diary etc) and read about three humorous stories to get back in the habit. It wasn't long however, before I craved something a with a little more 'tooth' to it. After foraging through Amazon for ideas, I came across a list of novels that should keep me busy. The library is my best friend, but apparently everyone else is in the same mood, because majority of those on my list are checked out. Argh. HOWEVER - American Pie was available last week .. and I am pleased to say, I enjoyed it very much! One of my FAVORITE novels ever is Prodigal Summer by Barbara Kingsolver. After reading it, I was drawn to her style of weaving multiple stories and characters into one. True to her style, midway through the novel, characters and stories began to combine leaving you with a rich sense of being upon completing. Since reading all of her books, I've been stumped to find anything like them. Until I picked up American Pie. I wouldn't call Michael Lee West's style even remotely close to that of Klingsolver, however, West spins a tale full of rich community, charactersrs and history. I loved it. And .... I'm on to start another of her novels, She Flew The Coop. I am a sucker for deep characters, rich community and a sense of history. I love stories that revolve around the south. And that, is where Michael Lee West has taken me. Freezer French Toast - Check it out! I found this on another blogging mommy's site. I'm having a 'why didn't I think of that' moment. If only I had this last FALL for the school year. Lexi is finished with school, but I'll be making a batch of these to avoid being over the stove on a warm sunny morning. Just pop in the toaster oven and 'voile'. Make your own freezer french toast rather than buying similar commercial frozen ones from the grocery store! Makes 16 slices for quick breakfasts. Heat oven to 500F. Combine eggs, milk, sugar, and salt, mixing well. Dip slices, then place on baking sheets sprayed with non-stick cooking spray. Bake about 5 minutes, until bottom is golden brown. Flip and cook for 2 more minutes. Cool then freeze in single layer. Once frozen (about two hours) they can be packaged individually or placed in a single freezer bag. Mason & Matisse Giveaway @ Adventures in Babywearing - oh boy oh boy oh boy!!! Not only was there are great link, but also an opportunity to win some incredible products from their store in a giveaway sponsored by Adventures in Babywearing! All you have to do is fill in the Mr. Linky at Adventures in Babywearing and then you must link to this contest and Mason & Matisse in a post on your blog telling everyone all about it! Mason & Matisse also have some promo codes to take advantage of as well - too good to waste! Good luck y'all. I'm keeping my fingers crossed. I see Baby Elizabeth's name all over this one!!! :) Regardless of the outcome, Adventures in Babywearing and Mason & Matisse are sites to add to your favs! Wait ... what did I just say?! "Hotdish is any of a variety of casserole dishes popular in the Midwest of the United States and especially in Minnesota, Wisconsin, North Dakota, and South Dakota. It consists of a starch and a protein (meat and/or a vegetable) mixed together with a binding ingredient (most often canned soup or a sauce) and a topping. In practice, typical ingredients are potatoes, ground beef and corn, with canned soup added for flavor and as a sauce, and seasoned with salt, pepper or tabasco sauce. Another popular hotdish is made with Kraft macaroni and cheese or plain noodles, canned tuna and peas, with canned soup - usually cream of mushroom - for binding. Cream of mushroom soup is so ubiquitous in hotdish that it is often referred to in such recipes as "Lutheran Binder," referring to hotdish's position as a staple of Lutheran-church cookbooks, although also made and enjoyed by all faiths in the region. Hotdish even made its way into books; Hotdish to Die For, a collection of six culinary mystery short stories in which the weapon of choice is hotdish, is a upper regional bestseller in Minnesota. Panko (Japanese bread crumbs) have in recent years become a popular topping, replacing the traditional (and higher in fat) potato chips. One of my FAVORITE blogs is by Ann Wood. She is incredibly talented and has carved out a niche with her creativity. I happen by her blog weekly and as I did so today, I found my namesake. Isn't she cute?! :) Stop by Ann's site. She is whimsical and unique and I'm glad I happened upon her! That's how I'm feeling right now. Frugality won this morning at the grocery store as I passed up my normal can of decaf coffee. See where this is going? J is Caffeine dependent. I am not. I haven't had a significant amount of caffeine since finding out I was pregnant with 'Moo'. She is now 18 months old. Why did I stay off caffeine? It was VERY hard getting off and once there, I liked it. I liked the fact that my body wasn't dependent on something - whether I felt the benefits or not. I liked that I wanted a cup of coffee in the morning because I ENJOYED it and didn't NEED it. On the occasion I did partake in something containing caffeine (IE, J's coffee or a badly craved McDonald's fountain Coke) I've often found myself a tad shaky and the mere feeling alone has kept me away. So why was I willing to pass the coffee aisle this morning? I'm cheap - lol. J is going away on business next week so I was doing the grocery shopping for the girls and I while he was away. We go through significantly less food when he is away, and I told myself that I would hide the money we saved for that week away in a sock for a rainy day (or better yet, my gardening kitty :) ). Thanks for stopping by to visit my new space! I've been blogging for over a year at our 'family' blog Thyen Party of Four. After becoming a little more 'versed' in the blogging world, I've found myself wanting to venture out from our daily musings about our family life and occurrences. There are so many creative outlets to blogging, but not always appropriate to list on the family site. Not everyone wants to read about playdates, holidays, and view photo after photo of our darling kiddos. Just the same, I doubt that my mom really cares what else is going on in the blog universe, what my latest finds and favs are etc etc. SO, I've created this site to use to branch out. I am a stay at home mom with two kids so my slant on these issues will be decidedly on the domesticated side. I love all your comments and welcome questions as well. Sit back and enjoy and be sure to check back regularly as I update and 'report' about my latest finds and favs!! I'm a stay at home mother of two, born in the Midwest, living in Downeast Maine. I'm married to my best friend J. We have two girls - 'Loula-Bell', who is 4 years and 'Moo', who is 18 months. BK (before kids), I worked in a number of jobs within the retail industry at the store and corporate level. I spent most of my time at the corporate offices of a big box retailer that sports a big red bullseye. Now I'm a stay at home mom! It's challenging and dang hard work :) but the salary and benefits outnumber any job I've ever had. My days are full of laughter, sometimes tears, but always satisfying and inspiring! "Simple pleasures is the key to life, you see. Planting lettuce. Rooting wild violets. Making grape jelly in August. Growing your own parsley and thyme. Hanging wet sheets on the line, feeling them slap against your legs like your own personal breeze. Hearing your mama tell you about when she was a girl and when HER mama was a girl, all the way back to Eve and the apple tree. Like I used to tell my Ruthie, While you're busy making your grocery lists and planning your schedules, real life is happening. And you know what, child? It sure enough is." J, Loula Bell, Moo & More - Family Suff!